This month I received the latest Little Alf magazine to review for you all and I’m pleased to say I enjoyed reading it. It is truly unlike any other magazine I have ever read and I must admit that when it comes to analysing it for this review, I have been left a bit puzzled! The first thing I noticed about the Little Alf Magazine (after all the gorgeous photos of Alf) was that it appears to be aimed a slightly older audience than the books, or at least the higher end of the rough 6-10 years age range. I got this impression because two of the articles in this issue (Issue 2) are about blogging/vlogging and advice for young writers. Now this could just be me thinking back to when I was that age, I certainly wasn’t interested in blogging or vlogging or even doing anything more online than chatting to my friends on MSN. But I do know that times have changed and children are so much more tech savvy and online driven than any other generation before them. And at that age I did enjoy telling stories. I wouldn’t have considered myself a writer, but I enjoyed reading and making up stories in my head. So maybe these articles are what younger children could be interested in now! However, although these articles could be a bit too advanced for Hannah’s regular book readers, I am sure these articles would be very inspirational for many young horsey people and I bet their mums would love reading about all the amazing things this young author has done already. So while Hannah’s regular audience might not be able to do these things at the time, it could give them the idea to aim for something similar in the future. But despite a lot of the content perhaps being too old for Hannah’s usual 6-10 age range of her books, the style of writing suits them perfectly. The text is big and easy to read with the language works perfectly for a younger audience. This combined with the large number of good quality photos and colouring in section at the back makes the magazine perfectly suitable for younger readers. However, saying that, I enjoyed all the articles. Some of the horsey ones were quite basic for me (baring in mind I have a degree in Equine Science) but at the same time, the ones about digital marketing and branding I found really interesting. As a Brand Ambassador, I am invested in the brand and keep myself up to date with what is going on and love hearing about what Hannah and Alf are up to. So I also really enjoyed hearing about future plans and the work with the RDA. I really have struggled to suggest the ideal audience for this magazine to be: horsey children aged 10-15 years old. But I get the impression that this could vary issue to issue. Although saying that, I do feel like it would be a good magazine for a young horsey family. There is a little bit of something in there for everyone and could be a great magazine to have in the car/at the yard to keep someone busy! Short fictional (semi-fictional) stories about Alf and friends. Maybe 1 or 2 in an issue about a page or two long. 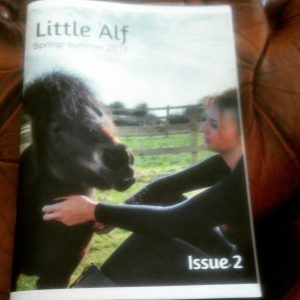 If you enjoy following Little Alf, have any interest in starting an online horsey business/blog or have young horsey children, then yes, I can recommend this magazine to you. As a 22 year old blogger, I thoroughly enjoyed the digital marketing/writing content and have read these sections several times.